Dustraction undertake hundreds of COSHH testing each year for companies nationwide. Our qualified engineers use the latest precision equipment to produce a comprehensive document on the performance of your extraction equipment. Control of Substances Hazardous to Health (COSHH) is the law that requires employers to control substances that are hazardous to health. Many companies work with substances that can be hazardous to health, such as spray paint particles and wood and plastic dust. COSHH testing is required by the Health & Safety Executive to ensure the equipment performs as originally intended and continues to adequately control the exposure of employees to substances hazardous to health. 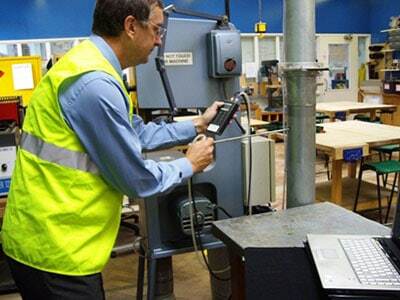 COSHH testing for dust and fume extraction is sometimes known as LEV (Local Exhaust Ventilation) testing. Dust and fumes can enter the body through inhalation or ingestion, and can potentially cause occupational asthma and dermatitis within the workforce. Some substances can have more serious effects on the body if inhaled over a long period of time. One of the main methods of averting such exposure to harmful dust and fumes is by installing a properly designed and maintained LEV system. Part of a company’s responsibility in complying with COSHH regulations is to ensure all LEV systems are working correctly and that they are regularly tested and maintained. If you employ more than five people you must document this testing. The document conforms to the legal requirements of the Health & Safety Executive COSHH regulations, the COSHH Approved Codes of Practice and the latest HSE Guidance publication HSG258:2008. In conjunction with the COSHH LEV test we provide a service inspection to ensure all mechanical aspects of the systems are working correctly. The COSHH documentation must be kept with your COSHH record for a minimum of 5 years and you must ensure that a thorough examination and retest is carried out, usually every 14 months but can be more frequent, by a competent LEV test engineer.